Somewhere beneath the sea, Ariana is waiting for you ringed with seaweeds red and brown. She offers all manner of delights, including stacked symbols and some good free spins, but on the whole, the bland gameplay and 5% vig don’t get us excited. 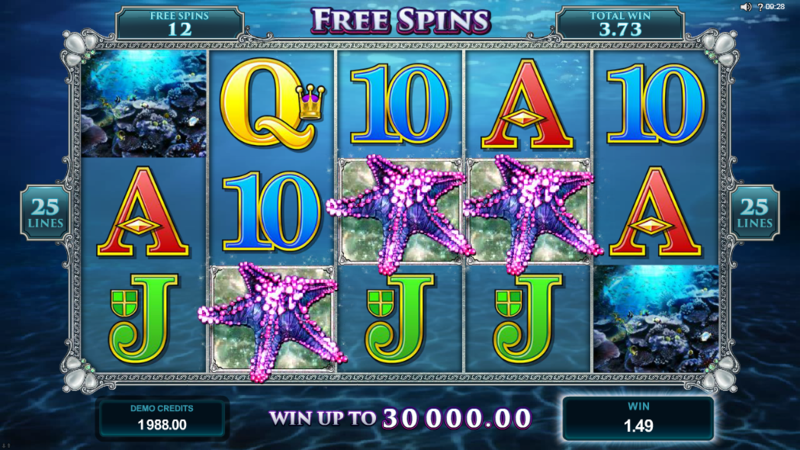 There is no shortage of mermaid-themed slot machines out there. Ariana is one of the prettier ones. 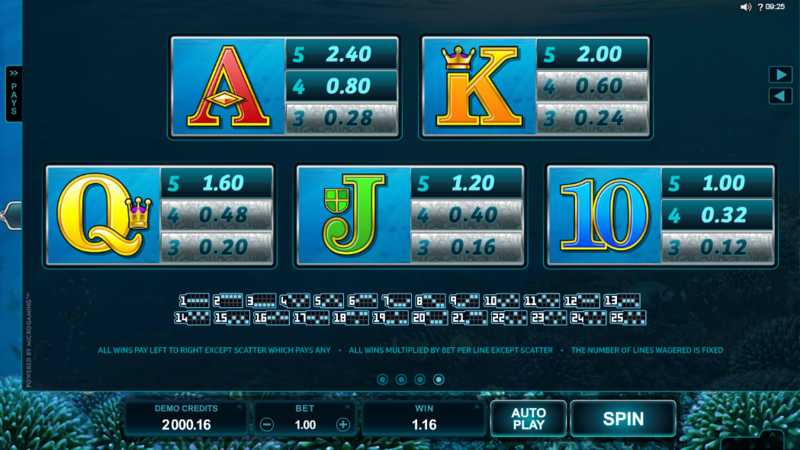 The creation of Microgaming’s design department Ariana is listed as the ‘heroine of the high seas’. She is a majestic mermaid, who inhabits a world of undersea creatures and sunken treasures for you to win. The graphics are lovely, with a deep background full of shoals of fish which drift in and out of the background. The symbols are all pretty well designed, and although the animations are nothing to write home about, they are pretty unobtrusive. The soundtrack is the real triumph, adding to the undersea atmosphere in a low-key way that allows you to play on and on without it getting annoying to listen to. Gameplay is pretty basic. 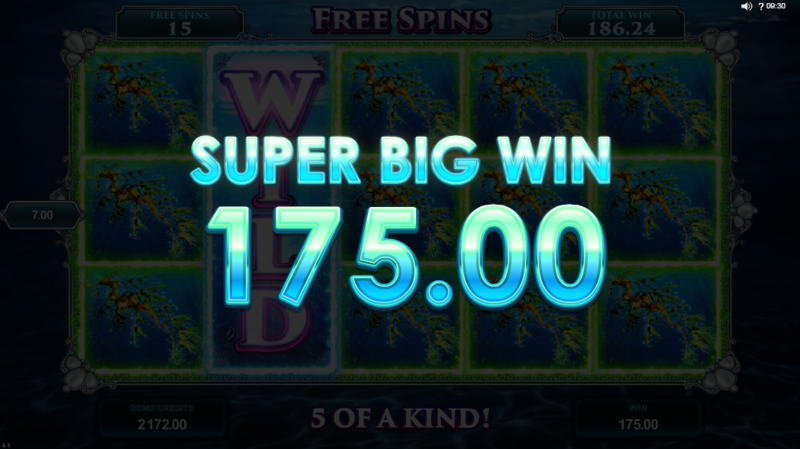 Five-reels, 25 pay lines and a free spin bonus. 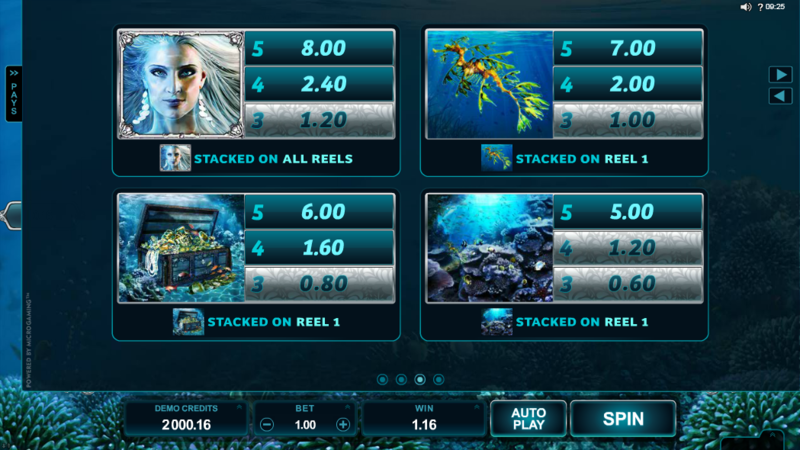 The main innovation is in the stacked symbols of reel one which can kick start you to a nice multiline win when you hit the same symbol across the whole reel. When this happens the same symbol you hit will expand to fill their rows on any other row they appear on. 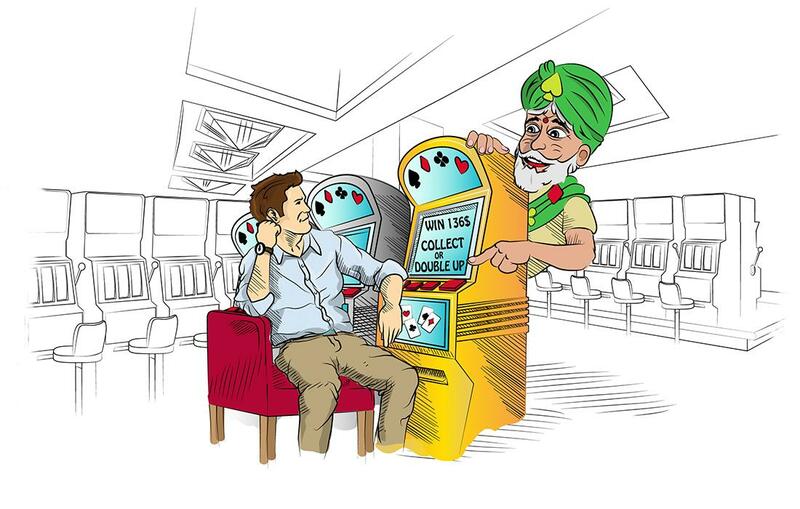 This can result in some pretty sweet payouts when you manage to hit a winner on most of the 25 pay lines as a result. 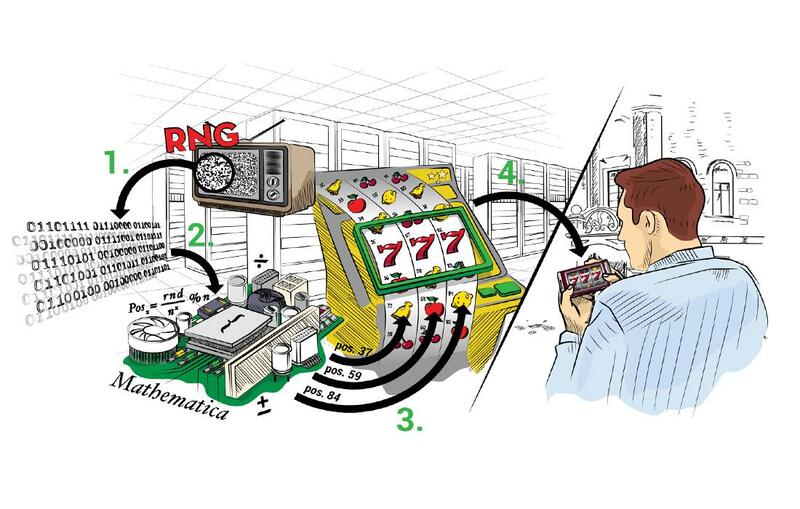 The Ariana symbol is stacked on all the reels just for an extra bit of spice and pays out 1,000 coins (against your 25 coin bet) if you catch five in a row. The stacked symbols also play a key role in the bonus features. The starfish symbol plays as both Scatter and Bonus symbol. It pays out as a normal scatter if you hit two or more of it on a single spin. 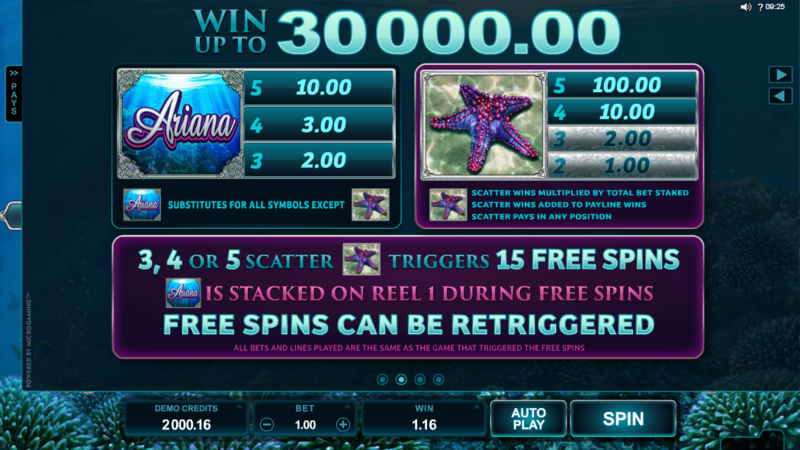 Hit 3, 4 or 5 scatter symbols and you also trigger a 15 free spin bonus game, which can be retriggered by hitting another three Scatters in one go. 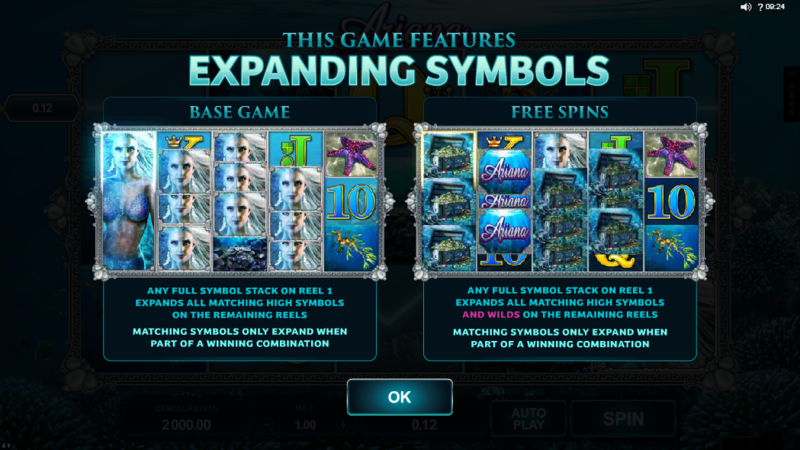 These 15 free spins come with the new feature where any Wild symbol that lands will expand to fill its reel. This helps you to hit the big bucks and gets you closer to hitting a ton of win lines at once. The game has a slightly below average return to player of 95%, which while acceptable in a higher volatility slot feels like a bit of an insult for something that falls squarely into the medium to low volatility range. 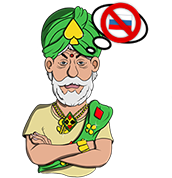 The game also lacks the kind of micro stakes betting smaller bankrolls might want. The minimum bet on the site we tested was £/$/€0.25 although the highest bet went up to £/$/€125 per spin. Ariana is nice to look at and enjoys an excellent free spin feature. Unfortunately, beneath the surface, Ariana’s kingdom turns out to be miserly with the payouts and short on features.